Video can be tough and uncomfortable to create but it’s pretty darn effective (and important). It’s important because it captures a certain element that the written word simply can’t. You get to hear the nuances in someone’s voice and see their facial expressions. It sounds simple sure, but often times, it’s easier said than done. So today, I have 5 video examples to share with you and then, I’d like to challenge you to create some video content of your own for your website. Simply put, video accelerates the know, like and trust factor. People can hear the nuances and tone in your voice. They can see the expressions in your face and they can familiarize themselves with you a whole lot faster. They remember a whole lot more of what they see and once it’s published on the web, it’s available 24/7 for a web audience to see (how’s that for round-the-clock marketing). 32,410,866,000 videos were viewed online for the month of January alone. That’s a lot of video consumption! An estimated 76% of the U.S. internet audience watched a video in the month of January. A video result is 50x more likely to appear on page one of Google search results for a search query than a web page for that same query. The concept here was simple. Every Friday, she’d feature a new local foreclosure in the area. She and her friend Laurie March (an interior designer) did a video walk-thru of the property, hi-lighting potential upgrades and design elements and then Irine closed with details on the price and stated whether this “fixer-upper” was a good investment or not based on the improvements that needed to be made. With a little bit of editing, the end result turned out great. Can you do something similar with a property in your market area? This is probably one of my favorite examples of the use of video on a real estate website. In this video, Garron Selliken records a screencast lasting about 3 minutes showing new site visitors how to navigate the IDX on his site. it’s a great instructional video welcoming site visitors and giving them a tour of how things operate around the site. It’s like a subtle Call To Action that says “hey, you want to search for homes? Go here…” The website is http://mportlandrealestate.com – you’ll find the video on the upper right-hand side of the page. Do you have IDX on your website? Can you record a quick video showing site visitors how to use it? Any time real estate agent Walter Burns gets a question from a buyer or seller, he creates a video with his response. In this video he explains the Home Inspection process for Hoboken Condominiums. Here’s how he grouped all of that video content for display on his website: http://www.livingonthehudson.com/hobokenvideos.php. How can you do something similar? What’s a question someone has asked you recently that you can record your video response to? Here’s an oldie but goodie from real estate agent Ted Mackel. Where every day real estate terminology might be common knowledge to you, it’s not always common knowledge to the first time homebuyer. So in this video, Real Estate Agent Ted Mackel explains what a Good Faith Estimate is (in detail). It’s a combination video/screencast. Then, here’s how Ted Mackel turned this into a blog post: http://homebuysblog.com/2010/06/01/video-blog-gfe-2010-simi-valley-borrowers-understanding-the-good-faith-estimate. Is there a real estate term that you can define on video to add a little personality to your content? Someone once advised that you need to sell the neighborhood before you sell the home when it comes to shooting video. It’s solid advice! So if you spend a lot of time in the field like Real Estate Agent Walter Burns does, why not take your camera out and record some footage of the area? Talk about what it’s like to live there. Hi-light specific features, areas, that make the community great. Show us why this community is such a great community to live in. Then, post it on your website for everyone else to see! What communities are you passionate about that you can capture on video? 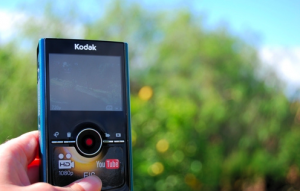 Step 1: Record your video — the Kodak Playtouch video camera with an external mic works great. If your doing a screencast, try Jing Pro (a Techsmith product); it costs $14.95/year. Step 2: Edit your video to include a subtitle caption. Your title should include: 1.) the title of your video (describing what it’s about), 2.) your website URL and/or other contact info. Step 3: Upload your video to YouTube (and any other video sharing sites of your choosing). Title and categorize your video appropriately. When titling it, try to use language that your prospective audience is going to search for. Step 4: Write a blog post or summary to support your video and embed your YouTube video into your post. For example, if you’re posting a video about a neighborhood market update, include a list of bullet points below the video in your post for those individuals that care to skim through your content. And presto, you have a new blog post rich with video content! Just remember, practice makes perfect… The more you create, the better you will get. How are YOU using video to creatively market your business on the web? What kind of equipment are you using (to record and edit your content)? If you’ve been at this for a while, what would you recommend to the novice vlogger? Yep, that’s the neat thing about video. It makes it easier for people to relate with you. It’s neat when you meet someone and you have something to talk about or they feel a connection because they saw one of your videos. And post the youtube video on facebook! it’s amazing how much people share good videos. We are very heavy into video. While we are a relatively new firm (opened in January), we have hundreds of videos on youtube (see http://rrea.tv). It has become a big source of traffic to our website. When we moved into our new location we put a full audio and video production studio in there. We have them on youtube, then share them on facebook, twitter, linkedin, and our blog. There are lots of new techniques to attract potential clients and customer and a competent property agent must be pretty aware of this updates as well as innovations that can surely a great help in business transaction and progression. I really need to start recording screencasts. They are so informative and a great way to educate our consumers. Great compilation of videos and how to use them. Love it! This gives me some great ideas for videos to add to what I’m doing.